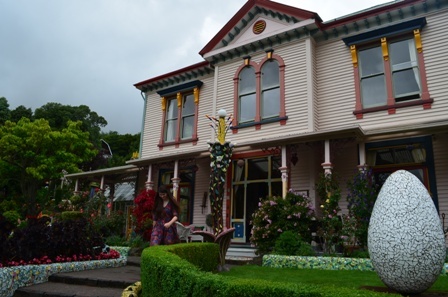 One of the days of my Christchurch stay was a day trip to the town of Akaroa. I’ve read many good things and other people recommended it. Akaroa is a small town on the shores of Akaroa Harbor, about a 90 minute drive from Christchurch. Akaroa was originally settled by a group of French settlers, who wanted to claim New Zealand for France (they just missed the opportunity, because by the time they arrived, the British had signed the Treaty of Waitangi, which gave the Maori people the rights and privileges as British subjects in exchange for acknowledging British sovereignty over New Zealand). 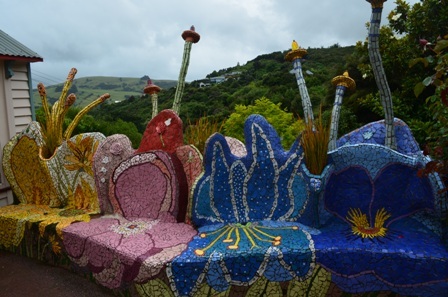 But Akaroa still retains its French roots in its architecture. Its street signs are still in French, and the French cemetery is actually the first consecrated burial ground in Canterbury (the area including Christchurch). I bet this town is filled with seaside charm when the weather is good and it is sunny out. Unfortunately that was not the day I visited. It was one of the rainiest days of my trip. It was cloudy and drizzly all day, intermixed with torrential downpours of rain. 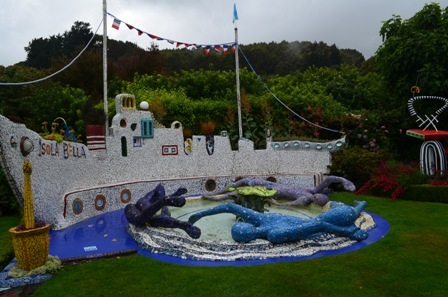 The weather however held up enough for my visit to the Giant’s House, which was the highlight of my trip to Akaroa. The Giant’s House history goes all the way to 1880 when it was first built. Apparently the name of the house originates from a story that a little girl looked up at the large house overlooking the valley, and said that a giant must live there. 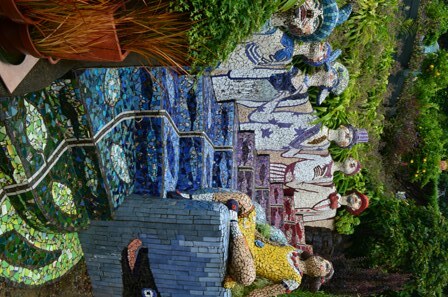 It’s current owner is artist Josie Martin, and she is responsible for creating the absolutely gorgeous and whimsical outdoor mosaic sculpture garden. 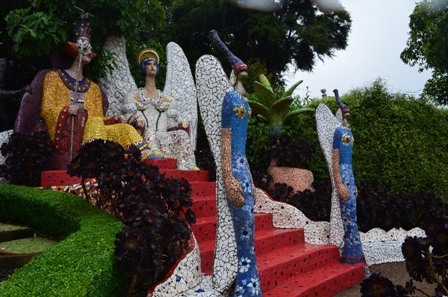 She is a painter, a sculptor and a creator of outdoor art installations. 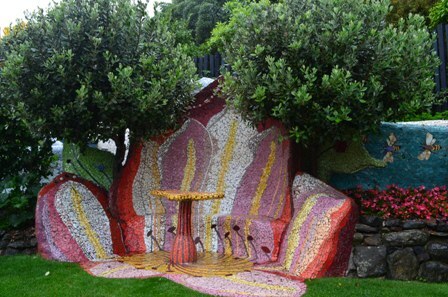 Josie spent years creating the outdoor concrete mosaic art sculptures of all sorts of designs. 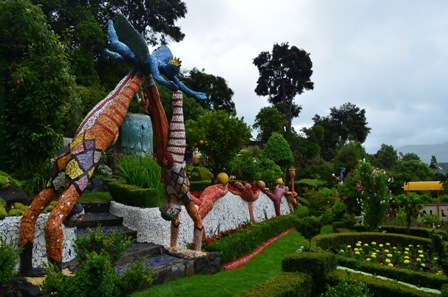 Some of the sculptures are flowers, animals, or people enjoying the garden. 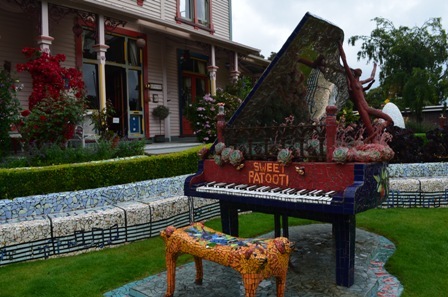 The piano sculpture in particular was inspired. I wish the weather was better during my visit, but you can’t do much about that. 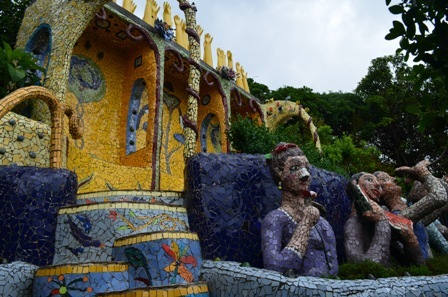 Thankfully it didn’t rain for MOST (but not all) of my visit to the garden, but I can see how this would be an absolutely delightful way to spend the afternoon. 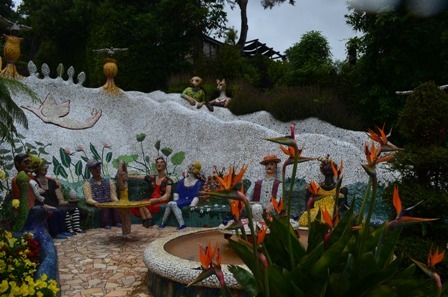 The price of admission for an adult is $20 NZ, which is rather pricy, but honestly I felt it was worth it, just because the garden is so unique, creative, beautiful and artistic. 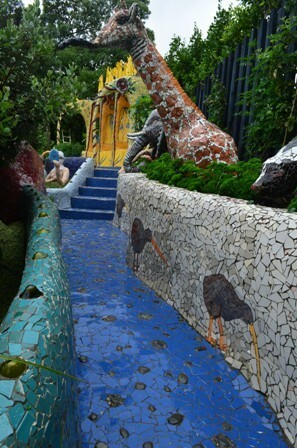 As a fledgling artist, I particularly found this garden inspiring. It made me want to go home and create my own artistic treasures at home. I’ve experimented with mosaics in the past, and I really did love them. Glass art is a deep passion of mine. Granted, it’s hard to pick a favorite among traditional copper foil stained glass, glass fusion and mosaics. They are all so different, but produce such beautiful creations. But the inspiration wasn’t specifically just about making mosaics, but rather create my own original artwork. So far, I’ve gotten better at creating paintings from the myriad of pictures from my travels, but I still want to create paintings purely from my imagination and design my own stained glass, rather than using patterns from stained glass books. 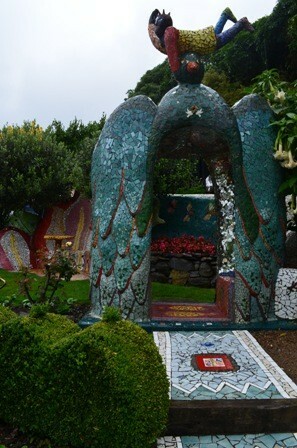 I HIGHLY recommend visiting the Giant’s House if you are in Akaroa. 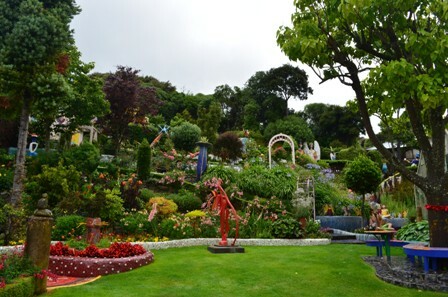 If you are an artist or a gardener yourself, you are likely to find inspiration here. Even if you just love looking at unusual beauty or gardens or art, you should find a lot to love here. 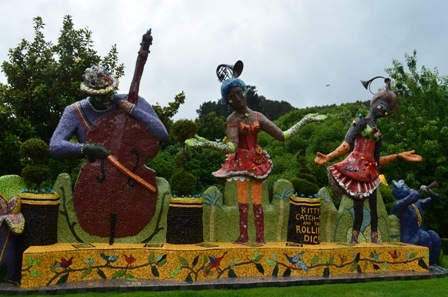 This entry was posted in Art, Travel and tagged Akaroa, Giant's House, mosaic art, New Zealand, sculpture garden. I’m so in love with this art work, it’s vibrant colors and whimsical design is an absolute delight.